1. A great one page "Setting the Stage" reading to be done before any format chosen. 2. 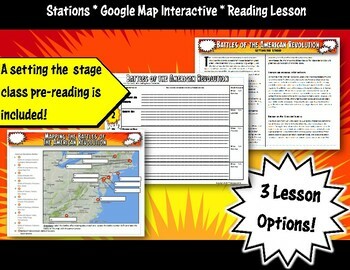 A visually fantastic ten station reading activity that comes with American Rervolution stations signs with soldier pictures, battle maps, a satellite map that students label and a student-driven graphic organizer with answer key. 3. 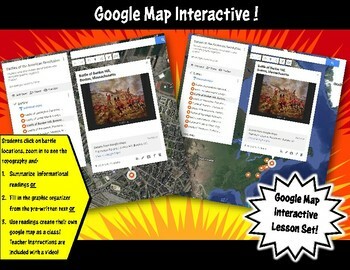 A google map activity set that comes with a link to a completed google map that has students click and zoom in to where the battles actually took place. Each click has pictures and information. Students can either record information from the map on a graphic organizer or they can create their own maps to share with the class! 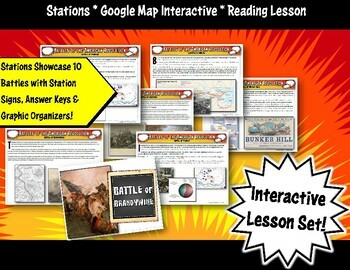 A video link is supplied to show students and teachers how to pin locations on Google Maps and paraphrase provided information about each battle! This is so cool! 4. 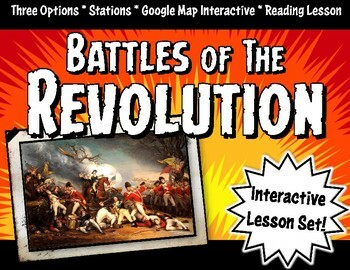 An American Revolution Battle Face-Off game that has students pair and choose a side to read about on a bi-fold battles page. After reading, the pair evaluates which battle contributed greater to the outcome of the Revolution. A winning side is determined and the winner of that battle "Face-Off" round gets points! Students complete a top 10 battles of the Battles of the American Revolution graphic organizer based on their evaluations. An answer key and teacher directions are provided!